The history of the Memorial Association was written by John M Vanderslice, a director of the Association. It was printed as a limited edition by J. B. Lippincott of Philadelphia in 1897. The frontispiece to this rare volume, was the map of the battlefield, presented here by the Gettysburg Discussion Group. The 1895 map is of course an evolved version of the 1886 edition, which has been updated to show the holdings of the Association as of 1895; the year this property was transferred to the care of the U.S. Government. As this map illustrates, the association had acquired substantial new holdings. Especially notable are acquisitions in the southern portion of the field. Parcels have been added in the area of the Round Tops, the South Cavalry field, the Peach Orchard and the 6th Corp positions of Neill avenue. The holdings of General Crawford have also been absorbed by the association. 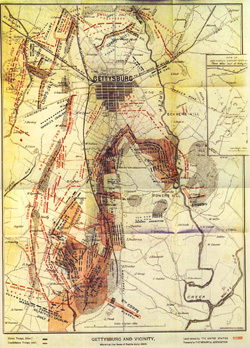 A representation of the East Cavalry battlefield has been added to this edition of the map, in accordance with the resolution of board of the GBMA on Aug. 11th, 1885. All of the GBMA maps measure approximately 14 x 18 inches. The 1895 map is from the collection of Terry Moyer.